Google’s Transparency Report is a document that shines light on threats to the internet, including copyright takedowns and government surveillance requests. On Tuesday, the search giant announced a new section that highlights sources of malware and phishing attacks. The coolest part of the report may be a heat map that lets a user mouse over countries to view the rate of suspicious sites. 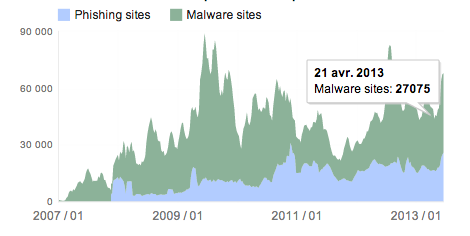 The United States scores very well; a Google scan of Autonomous Systems turned up a malware rate of only 2%. You can see the country-by-country map here. Oh my, it seems like people need to watch themselves a little more carefully from now on; or have an attorney on deck. malware is eating into devices like a disease and there little being done expecially in mobile devices where there is little malwaresecurity i thing that is an area that have being left by the industry.